Some of the journeys we make in life are quite special and stay in your memory forever. This is one such journey, just two days of my life but they were an awesome two days and I was working too. This trip is the story of a two day two night camping trip with some fab clients. I do love my job! We started the journey as with many others, with a trip too the supermercato for supplies. Then we drove the short distance to La Aprerra to load and launch the kayaks. La Aprerra is a small beach in a small and beautiful bay. There are boat moorings there too so it makes the perfect launch spot for the journey we were undertaking. The weather was grey when we launched so I didn't take many pictures, I was just content to be on the water knowing that the best pictures were still to come. The above image is taken at a small beach I know at Porto Rotondo, where we stopped for coffee and lunch. before leaving the beaches and holiday homes far behind and finding our wilderness! The coast here is low lying with amazing rock sculptures, in sharp contrast to what we'll see on the morrow! After a much needed coffee and some melon the tents went up and we could relax and absorb our surroundings, which were pretty damn good! Come morning I amble out of bed and start the day with a swim and a coffee. I even got to see a full and orange moon set over the hill that I live on. Magic! We had a lovely lazy morning before getting back in the kayaks and I was pretty excited as I knew just how amazing the days paddle was going to be! Did I mention the sea is very clear!? As we left camp we soon left the low lying landscapes behind and the scenery became a lot more grand and impressive as the limestone cliffs rose high from the waters edge, reaching for the blue skies above. We stayed in close to really get a feel for the height of the cliffs. In some places they would overhang you completely by quite a large amount! Looking up here was very special and it also provides some welcome shade from the sun. Limestone is known for caves but there aren't that many here? This is the best one that I've found and I can never resist going in! Slowly Capo Ceraso comes into the distant view and I saw that we were reaching the tip of Capo Figari. The landscape begins to change again and become more gentle. As we pass the high cliffs of Capo Figari we soon spot Isola di Figarolo where we plan to camp for the night. This is a Corsican Gull, a bit of a speciality in this area and very beautiful too! We went around the island and headed out to the fish farm in the hope of seeing the Dolphins. It was all very quiet there but we were to have more luck in the evening. Our very lovely camp site on Isola di Figarolo. I've been meaning to camp here for a while and it really was as good as I expected. Even in peak season it was quiet in the evening with just a handful of yatchs moored offshore. A lovely sunset accompanied with Dolphins leaping from the water! I chose to enjoy the moment so didn't get a picture this time. As we leave camp for the final short paddle to our pick up point I was unaware of the very special final treat that this journey was about to bless us with! This was the real highlight of the trip for me! Seeing the wild Mouflon on Isola di Figarolo! These were taken in the morning but we also saw them in the evening too, but to get pictures as well, Wow! 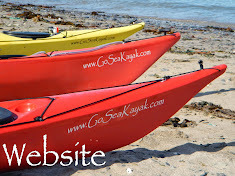 This really is a very special place to paddle so if you would like to experience sea kayaking why don't you get in touch and book a camping trip with us. Why not follow us on Facebook too?